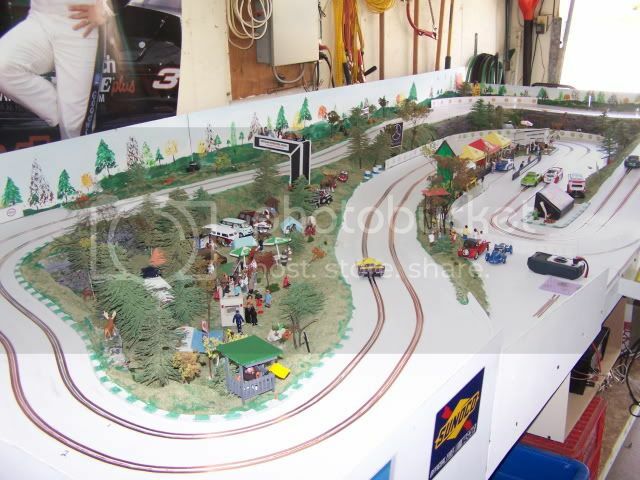 I am leaning towards getting a DS 200 lap counter for my NINCO layout but would like some opinions first. Is anyone using this and how do you like it? I have been using one. Initially I had a lot of trouble. I returned the first two as they did not work. The third from another dealer worked like a charm. It has survived freezing temps in my garage for over a year now. IMHO The DS kit is quite expensive and doesn't really offer much for your investment, true you can add a PC to it, but that pushes up the cost further. If you want a PC based system, you can make the actual gantry and lap counting sensors quite cheaply, take a look at http://asr.avasig.com/index.php?page...ter-and-timing for a simple parallel port interface. I've had a complete DS set (light bridge, lap counter and Stop and Go boxes) for the past 6 years, and it works great still to this day... It's plug and play, and reliable. Just make sure you buy the correct power source from Radio Shack. The only lacking thing is the Winslot software, but I believe there are other available software that works. Hope this helps! I have been using DS systems for 10 years now and I love them. They are extremely easy to set up and use (except that you may have a little difficulty at first because the instructions are not the best they could be but you get past that quickly), compact and portable, and very reliable, even under conditions bordering on outright abuse. I have a 4-lane system on my track and it does everything I need and more. I use another one on a track that goes all over the place for public participation events and it has been totally reliable, even when used and handled by non-experts. It is well worth the money. One hint: use the light bridge, not the sensor tracks. I've been using a DS200 for about 7-8 months now and have never had a single problem with it. I was a little intimidated with hooking it up at first - I'm not an electronics kind of guy - but once I put my feeble mind to it, it was actually fairly easy. Also, I use the light bridge, not the sensor track. thanks for the replies. I plan on purchasing one and will start looking for one. I will use the light bridge. What are some of the difficulties with hooking it up? Can I still use the stock NINCO terminal track for controller and power hook ups? Yes, the DS 200/300 system is completely independent of your power connections. I was racing with it within 15 minutes of pulling the bits out of the box. One thing is that the light bridge does fit under whatever section of track you are using for the start so it will be elevated a bit higher than the rest of your track. Suggest fitting the bridge somewhere that cars will not hit it (like the middle or end of a long straight. As mentioned, the instructions on the various functions are not well written. At least not on my DS 300. I have had mine for nearly two years and it has functioned flawlessly the whole time. The place I got it also had a proper power supply and sold it to me with the set at cost. I wish I could remember who it was so I could give them a Kudo. Last edited by svanaken; 11-21-2009, 06:34 PM. I have been looking but can't find a place that has it in stock. A couple months late, sorry. I'm sure you're up and running by now. Tells you how to set up and operate.